Edinburgh, a city of Scotland, capital of Edinburghshire, about 2 m. S. of the frith of Forth, 357 m. N. N. W. of London by road, and 399 m. by the Great Northern railway, in lat. 55° 57' N., Ion. 3° 11' W.; pop. in 1871, 196,500. It is built principally on three parallel ridges running E. and W., the central one terminated on the west by a mass of rock seven acres in extent at the top, which is 443 ft. above the sea, and upon which stands Edinburgh castle. The palace of Holyrood is at the E. end of the same ridge. Along the top of the ridge runs the principal street of the old town for the distance of a mile, its successive parts being named Castle Hill, Lawn Market, the High street, Netherbow, and Canon-gate; it contains many public buildings, and is a fine street. Upon the sides of the ridge are the ancient houses, five, six, and sometimes ten and eleven stories high, laid out in flats, in which are concentrated a great part of the poor population. Steep lanes descend from the high ground on both sides, some not more than six feet wide, and others broad enough to i admit the passage of a cart or carriage; the narrower ones are called closes, and the wider ones wynds. Along the valley into which these closes and wynds descend on the south runs Cowgate, which was once a fashionable street. At its W. extremity toward the cas- tle is an open rectangular space called the | Grass market. Near the E. end rises a belt of precipitous rocks called Salisbury crags, 547 ft. above the sea, behind which is a conical hill called Arthur's Seat, 822 ft. high. The S. portion of the city is connected with the old town by two bridges over the valley : South bridge, finished in 1788, and George the Fourth's bridge, finished in 1836. It is bounded S. by a large level park, called the Meadows. The ridge on which this part of the town stands is more elevated than that occupied by the new town, but the latter is much more handsomely built. 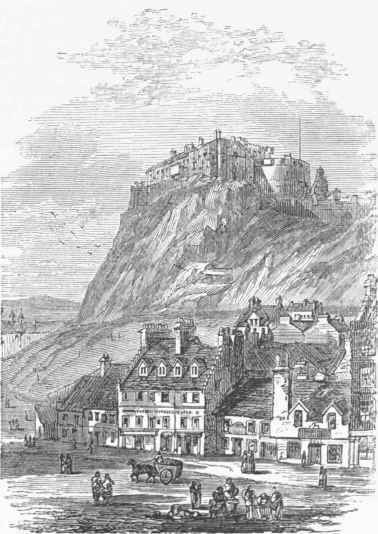 It is N. of the castle and the High street, and separated from them by a valley, crossed by the North bridge, which is opposite the South bridge, and was opened for use in 1768, and by a broad causeway, called the Earthen Mound, which has been a thoroughfare since the commencement of the century. This valley formed for centuries a lake called the North Loch, but it was drained in 1763, and has been laid out in gardens. The laying out of the new town beyond these gardens was begun in 1767. Its streets have a regularity and magnificence in strong contrast with those of the old town. The three principal ones are Queen, George, and Princes streets, parallel with each other and with the High street. George street runs along the middle of the ridge. Princes street is between it and the High street, and is one of the finest promenades in Europe; it is built up only on one side, and commands a fine view of the castle and the old town. Queen street is N. of George street, and fronts toward the north on the Queen street gardens. The new town is adorned by many fine open squares, among which are St. Andrew square, Charlotte square, Drummond place, Moray place, the Royal Circus, etc. East of the new town is a rocky eminence called Calton hill, the broad, verdant summit of which is studded with monuments and looks out upon the frith of Forth. The new town is bounded on the north by a small stream called the Water of Leith, which empties into the frith at Leith, the port of Edinburgh, distant 2 m. Leith is connected with Edinburgh by a spacious street called the Leith Walk. - Edinburgh castle is one of the most remarkable public buildings of the city. In former times it was called Castrum Puellarum, because, as it is said, the daughters of the Pictish kings resided there before their marriage. Its position upon a rugged basaltic rock, perpendicular on all sides except that next the old town, is picturesque and romantic. Its construction is irregular, and it has no great value as a fortification. It can accommodate 2,000 soldiers, and has an armory with space for 30,000 stand of arms. On its summit is a huge cannon, Mons Meg, formed of staves of wrought iron surrounded by hoops, supposed to have been constructed at Mons, Hainaut, in 1468. The regalia of Scotland, consisting of the crown, sceptre, sword of state, and treasurer's mace, are deposited in the crown room of the castle, and on the ground floor is a small apartment in which Queen Mary gave birth to James VI. The palace of Holyrood, in the E. part of the town, was the ancient residence of the Scottish kings. A part of the present structure was built in 1528, in the reign of James V. The edifice is quadrangular, with an open square in the centre, the sides of which are 94 ft. long. This palace was the residence of Mary, queen of Scots, and was the scene of Rizzio's murder. The queen's bedchamber is still shown almost exactly in the same state as when she occupied it. The largest apartment in the palace is known as the picture gallery; it contains 106 pictures which purport to be portraits of the ancient kings of Scotland. Adjoining the palace are the ruins of the abbey of Holyrood, founded by David I. in 1128. Its precincts, including Salisbury crags and Arthur's Seat, are a sanctuary within which debtors are privileged from arrest. The royal institution, one of the finest buildings of Edinburgh, built between 1823 and 1836, stands at the termination of the Earthen Mound and fronts on Princes street. It has a range of Doric pillars on each side and one in front. It belongs to the board of trustees for manufactures in Scotland, and furnishes rooms for the accommodation of the royal institution for the encouragement of fine arts in Scotland, and for other institutions. The national gallery of painting and sculpture stands upon the Mound; it is a fine building of the Ionic order of architecture. At the E. end of Princes street is the register house, a costly building 200 ft. long and 120 ft. broad, designed for the accommodation of the records of the Scottish supreme court, etc. Victoria hall, for the use of the general assembly of the church of Scotland, with its spire 241 ft. high, occupies a conspicuous position upon Castle hill. - Edinburgh is remarkable for the number of its monuments erected in honor of distinguished men. 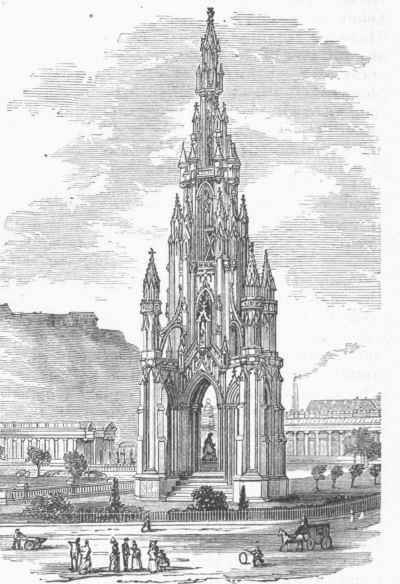 The Scott monument in Princes street is 200 ft. high. A marble statue of Sir Walter by Steell is in its centre, and it has niches for representations of the principal characters in his writings. On Calton hill are monuments in honor of Dugald Stewart, Play-fair, Nelson, and the Scotch soldiers who fell at Waterloo. On the S. side of the hill is the Burns monument, with a statue by Flaxman. Within the city are monuments also to Hume, Lord Melville, George IV., William Pitt (by Chantrey), the duke of Wellington, and others. - Edinburgh formerly consisted of a single parish, of which John Knox was for a time minister. The parish church was St. Giles's in the High street, named after the tutelary saint of the city. It is an ancient cathedral, 206 ft. long, containing three separate places of worship, and adorned with a square tower which is surmounted by arches. They unite in the centre and support a spire which rises to the height of 161 ft. from the ground. The Tron church, so named from the tron or weighing beam which was formerly on or near its site, is in the High street at the intersection of the South bridge. The city has several other noted churches, of which three are Roman Catholic. - Among the charitable institutions, the most noted is George Heriot's hospital, founded by George Heriot, goldsmith and jeweller to James VI. ; it is a fine old Elizabethan structure, designed by Inigo Jones. It is near the Grass market, on what is called High Riggs. It has a revenue of more than £17,000, which is appropriated for the maintenance and education of children at the hospital, and for the establishment of free schools in different parts of the city. The hospital for the maintenance of poor children, erected out of funds amounting to £210,000 bequeathed by James Donaldson, printer, in 1830, is a handsome building. There are also within the city George Watson's, John Watson's, Gillespie's, and the orphan hospitals, the asylum for the blind, the deaf and dumb institution, and many other similar establishments. Edinburgh is also noted for its educational institutions. The principal of these is the university, which was chartered by James VI. in 1582. The front of the college building, 356 ft. long, is in South Bridge street. The building is of Roman architecture, heavy in design and massive in execution. There are faculties of theology, law, medicine, and the arts, with over 30 professorships. The many eminent instructors who have been employed in the medical school have given it a rank among the first in Europe. The university derives a revenue of £1,172 from foundations or bursaries, which is applied in aid of 80 poor students. The total number of matriculated students in 1872-'3 was 1,906, including 728 in medicine. Students are not required to live within the college walls, and are not subjected to discipline except when in attendance at the college. The university library contains 120-000 printed volumes and 500 volumes of MSS. The high school was founded in 1519; its present building, on the S. slope of Calton hill, was opened for use in 1829, and cost £34,-000. It has a rector and four Greek and Latin masters, and the average number of students is between 400 and 500. The college founded under the auspices of the Free church is at the S. end of the Mound, and has about 500 students. There are many private medical schools of celebrity in the city which are not connected with the university. Students who attend them may obtain degrees in surgery upon examination from the royal college of surgeons. Among the other schools are the Edinburgh academy, the naval and military academy, the normal schools, Dr. Bell's schools, the Lancas-terian schools, and the school of arts. The royal association has spent since its foundation £130,000 for promoting the fine arts, besides £81,000 for pictures and sculptures, and £3,000 for works to be deposited in the Scott gallery. The corner stone of the Watt institution and school of art was laid in October, 1872. - Edinburgh is the seat of the supreme courts of Scotland. The court which has supreme jurisdiction in law and equity is called the court of session, and is composed of 13 judges or lords. The court of supreme criminal jurisdiction is called the high court of justiciary. The right of pleading in the court of session belongs exclusively to an association of barristers called the faculty of advocates, and the privilege of preparing such papers and warrants as require the royal seal or signet is vested exclusively in the writers of the signet. The judges and members of the supreme courts, including the advocates and writers of the signet, form what is called the college of justice, an institution founded by James V. in 1532. The old parliament house of Scotland is appropriated to the use of this body. It is in the heart of the old town, separated from the High street by Parliament square and the cathedral of St. Giles. Connected with it are the libraries of the writers of the signet and the faculty of advocates, both of which are extremely valuable, the latter being the finest in Scotland, and containing 150-000 volumes. - Several railways centre in Edinburgh. The Edinburgh and Glasgow, the North British, and the Granton have their termini in the valley N. of the old town, near the North bridge. The terminus of the Caledonian is in the W. part of the city, and of the Dalkeith line in the E. Through the Union canal, which connects with the Forth and Clyde canal, Edinburgh has communication with Glasgow. - On the establishment of the "Edinburgh Review " (1802) and the publication of the earlier works of Sir Walter Scott, Edinburgh began to be the seat of a large publishing business. There are about 60 printing houses, which give employment to more than 1,000 workmen. About 500 are employed in bookbinding. The manufactures of the city are not very important, but ale, shawls, carriages, and linen are made, and iron founding is carried on to some extent. The city is governed by a council of 41 members, which elects from its own number a lord provost, and six bailies, who constitute the civic magistracy. It has two representatives in parliament. - The city is supposed to have received the name of Edwin's burgh early in the 7th century, from Edwin, king of Northumbrian who is said to have made it his place of residence. The name of the place in Gaelic was Dunedin. It became a walled town and the capital of Scotland in the loth century, when, after the murder of James I., its castle was selected as the only sufficient stronghold for the royal family and the government offices. The necessity of keeping within the walls was the cause of the houses being extended to such unusual heights. 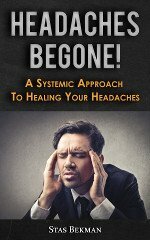 In 1513 the city was desolated by the plague. In 1544 the earl of Hertford, landing at Leith with an English army, set fire to the town, but failed to take the castle. Many conflicts took place here during the minority of James V.; one of the most violent, in which 200 men were killed, was between the Hamiltons and Douglases, and is known in history as "clear the causeway." While John Knox was minister of Edinburgh, his preaching in 1556 gave occasion to tumults which were followed by the triumph of Protestantism. Disturbances also arose on the marriage of Queen Mary with Bothwell, and on the accession of James VI. of Scotland to the throne of England, when the union of the two kingdoms was proposed. In 1650 Cromwell, after the battle of Dunbar, took possession of the city and castle. From 1663 to 1685 large numbers of Covenanters were executed here on account of their faith. In 1730 John Porteons, captain of the city guards, ordered his men to fire upon a mob, and 6 men were killed and 11 wounded; he was tried, convicted, and condemned to death. He was reprieved by Queen Caroline, then regent, and so much indignation was aroused thereby that he was forcibly taken out of prison by another mob and hanged. This prison, the Old Tol-booth, also called the Heart of Mid-Lothian, was taken down in 1817. Sir Walter Scott introduced the breaking open of the jail by the Porteous mob into the novel which he named after it.